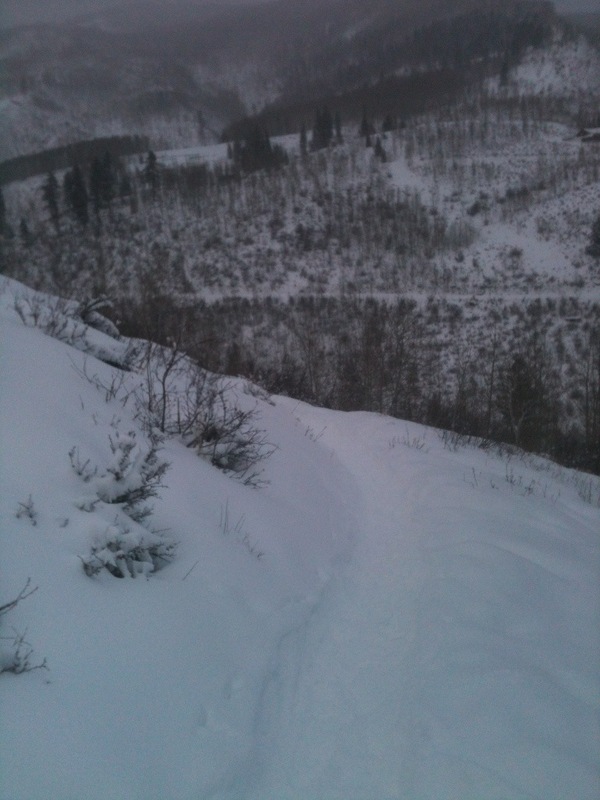 1/18/2014-Vertical Runner Group Run and some North Trail with Rooster. 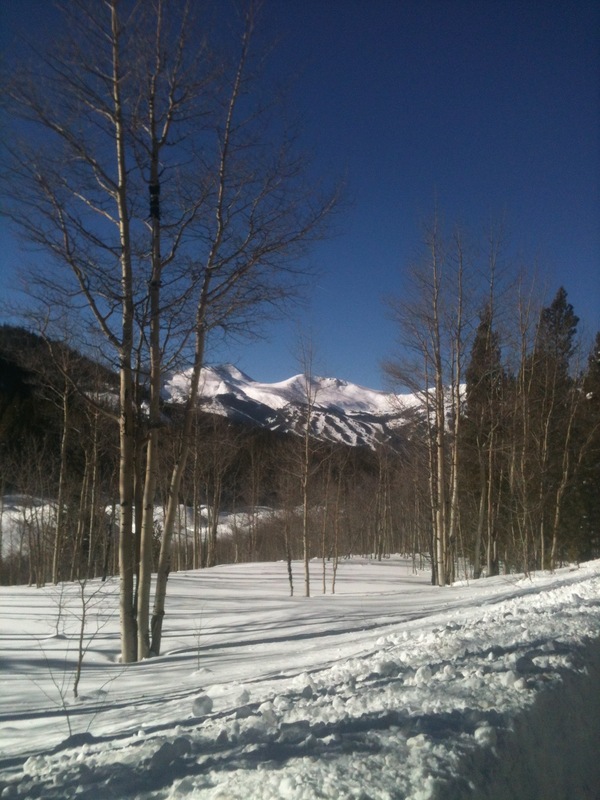 What a gorgeous blue bird day in Colorado! After what seemed like weeks of snow then a few days of work it was amazing to get out on the trails and soak up the SUN! Every Saturday my team shop Vertical Runner Breckenridge host a group run. 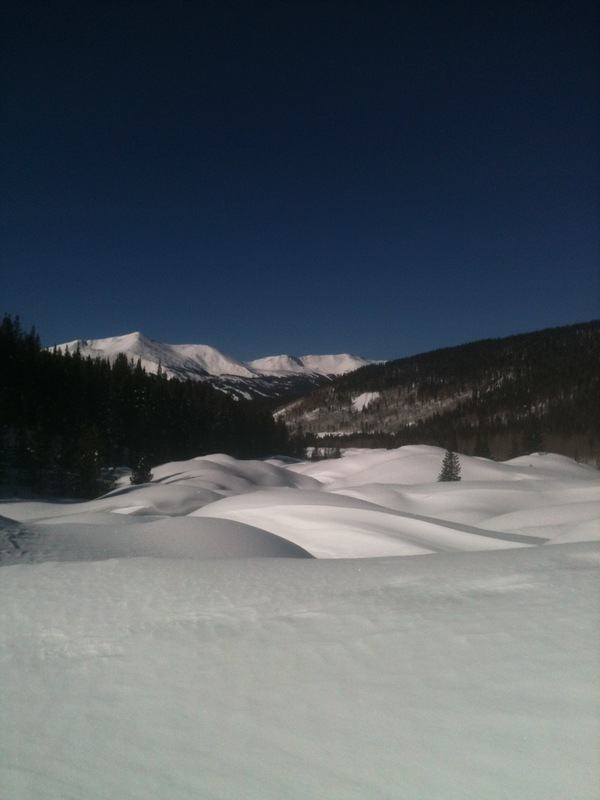 The drive over from Vail was absolutely stunning and the views never get old. 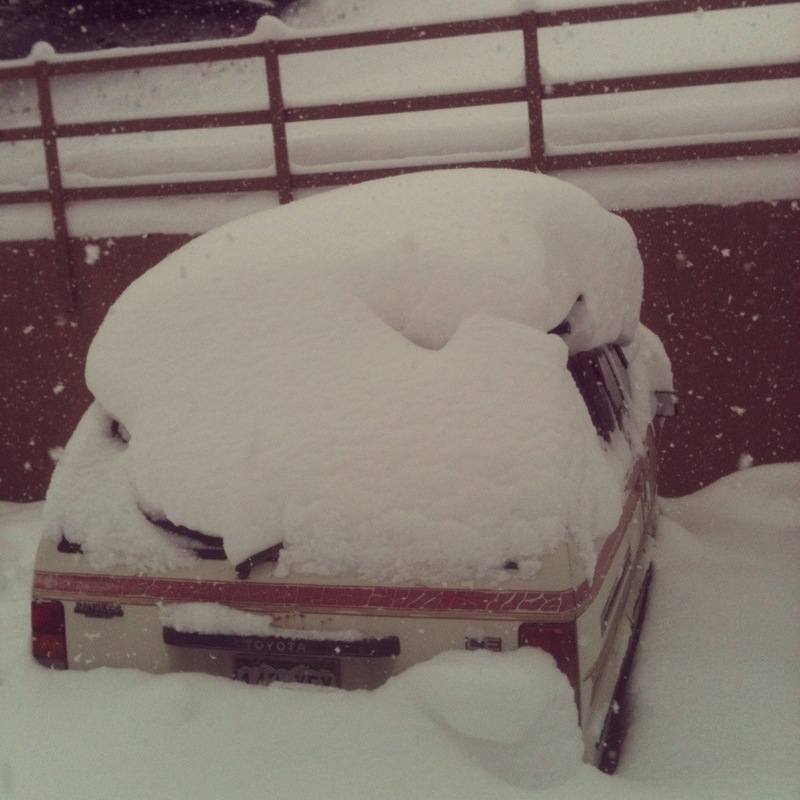 The snow is getting really deep and I saw tons of Avalanche slides along the pass. I pulled into Breck and the town was getting busy for MLK weekend so I was happy get a parking spot right behind the shop. I ran over to Kava Café for a banana and double espresso. Vertical Runner is an extremely cool specialty running shop right on Main Street and out the back door is Breckenridge ski resort. 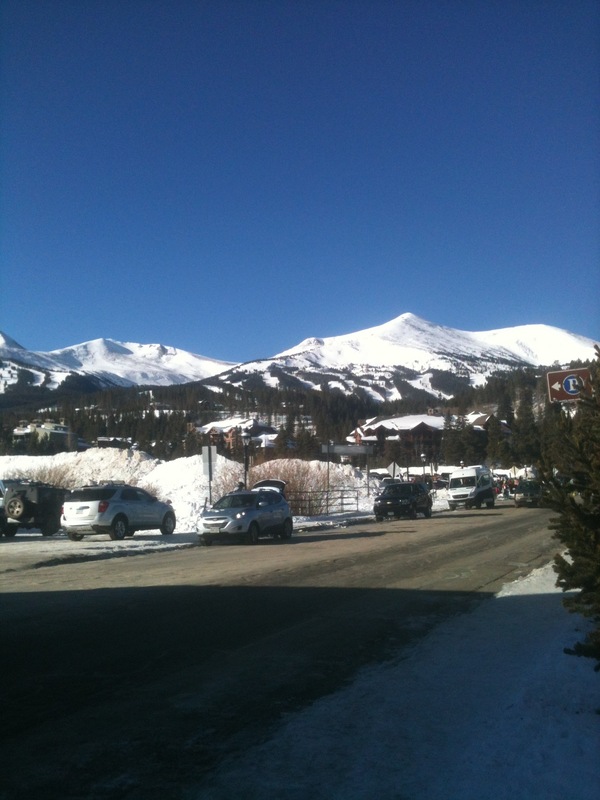 I can’t wait to hang out behind the shop after group runs this summer and it makes me miss living in Breck. Attendance for these group runs is hit or miss as in ski country most people are either working or skiing this time of year. This run was dedicated to Megs Miles, in honor of a runner killed by a DUI driver last week. It was a very sad story and runners nation wide are running for her today. Runner safety is a serious thing and people need to raise awareness of DUI and texting while driving. I met two very nice Ladies who run for the shop as well, Lacy and Lauren. The three of us headed out for the run towards the French Gulch and Wellington area, an area I use to run and bike in a lot when I lived in Breck. It’s an old mining area with lots of single track and mining ruins. I was impressed at how nicely packed out all the trails were. 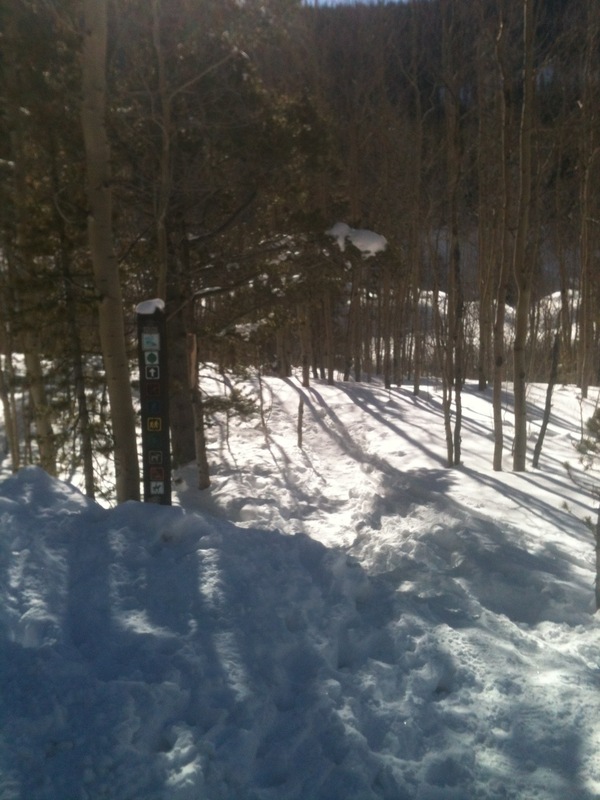 We cruised along B&B mine trail and X10U8 trail, the snow was fresh, deep, and beautiful. 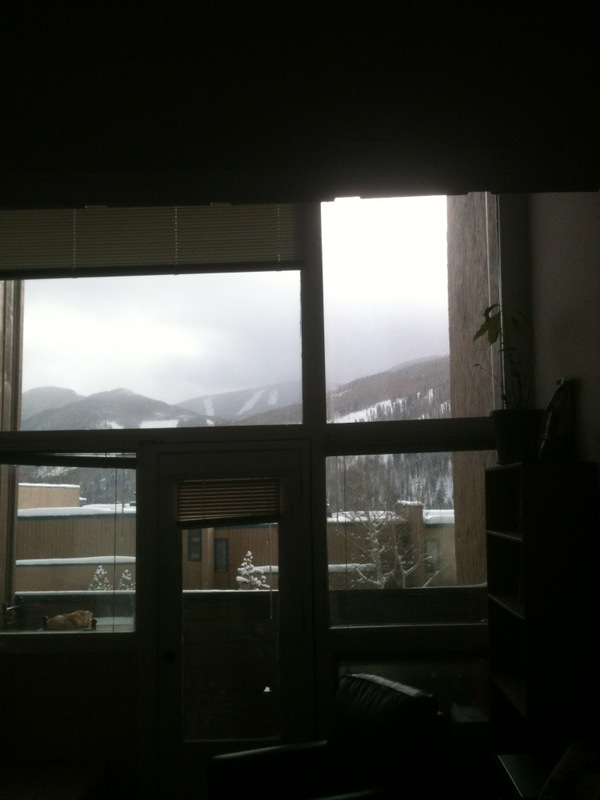 The whole time I heard avalanche bombs going off and it reminded me of living way up at 10,000ft on Baldy Mountain when I first moved to Breckenridge 4 years ago. It was such a nice run and i really enjoyed just being out on the trails taking in the sun and views thinking of memories of when i started running in Breck years ago. We took the road and sidewalks back to the shop and racked up 7 miles. There was supposed to be a Newton demo but they got held up in I-70 traffic so I wore my old and trusty scarpa sparks. 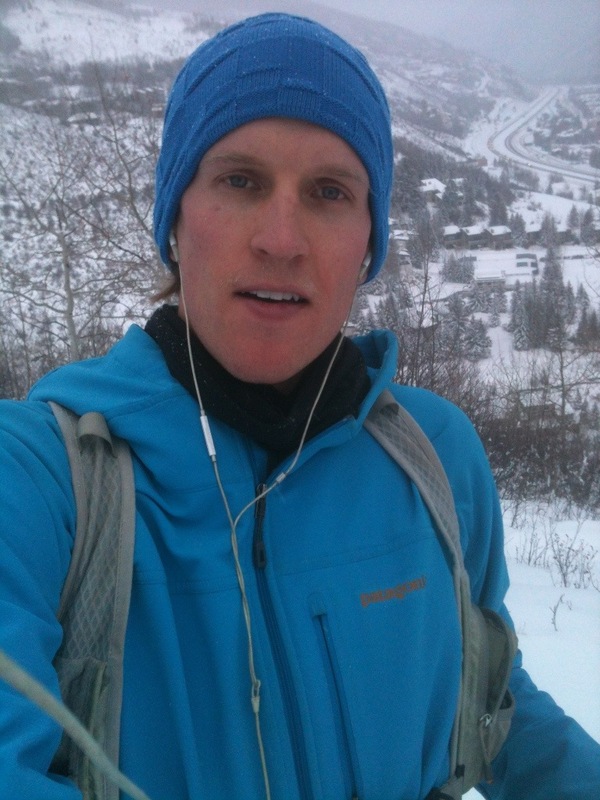 I scored a sweet new Vertical Runner hoody and headed back over to Vail and Rooster. On my way through Frisco I stopped at my favorite Health Food store, Alpine Health Foods, I found some amazing Wild Boar and Elk brats, Cacao/Goji Berry Nuggets, Coconut Flour, Dried Papaya, Coconut Dates, and Chia Kombucha. When I got back to Vail it was still beautiful outside and I had awhile before work so I took Rooster up the North Trail a little ways. I wore my new Altra Lone Peak 1.5s which I am still getting use to and will try to review soon. 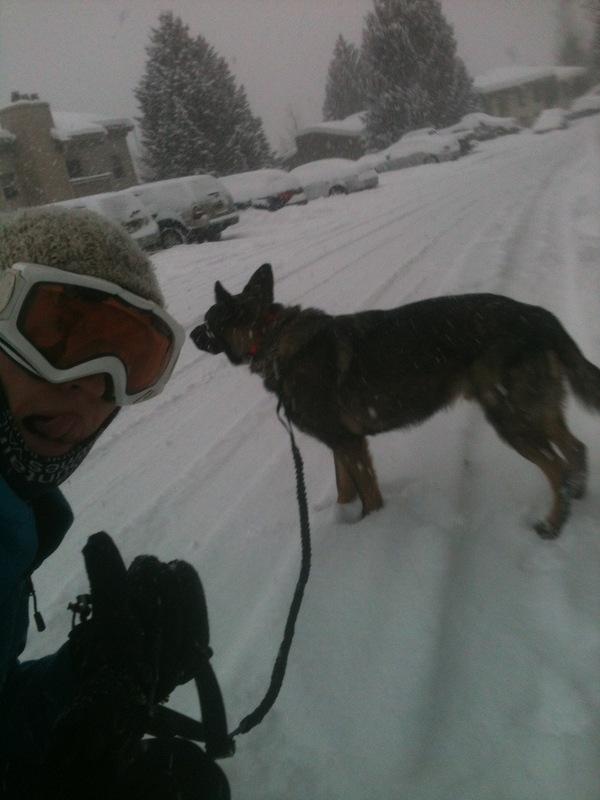 My legs were getting tired at this point but it was good to be out in the snow and sun with my dog. What have I been eating??? Over the past couple years I have learned more and more how nutrition and eating right can affect your running and overall health. It started with Chia seeds and smoothies, I went vegan for a while, now it’s more of a high fat low carb diet. I am still doing smoothies but have tried lots of different ingredients and appreciate them post run more than ever. The other day after my run I made a smoothie that was simple, delicious, and easy to drink. I have been using my Ninja food processer because I found that the larger blender is just unnecessary when its only one smoothie. 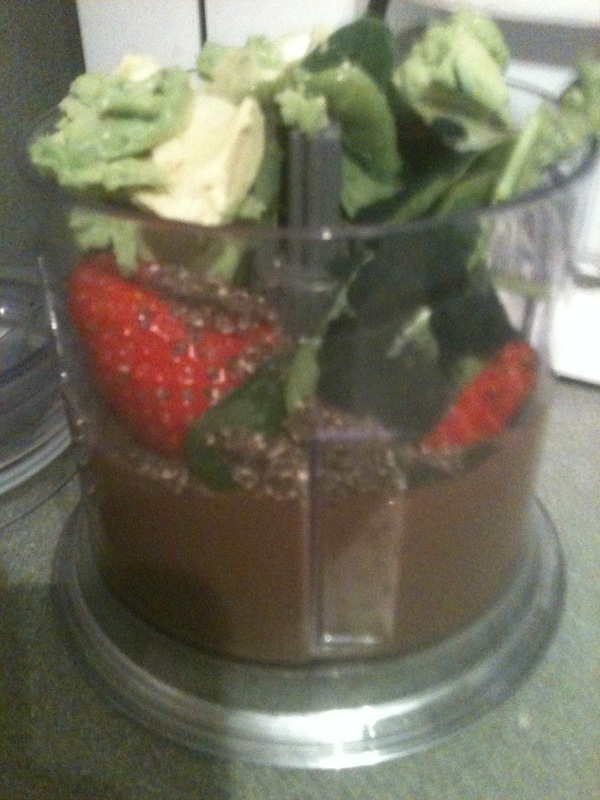 Smoothies always vary depending on what I have in my fridge and this is what I had after this run, Chocolate Almond Milk, Organic Power Greens (Kale, Chard, and Arugula), Organic Strawberries, Organic Avocado, Spirulina, and Chia Seeds. Everyone has been telling me to try Avacado in a smoothie and I finally did, it really gives it a nice creamy texture and goes well with the chocolate. Dinner is a bit different, always depending on what I am in the mood for and who’s eating with me. I love cooking and eating, trying new things and experimenting with the old. This past week I made an awesome fried rice dish one night, and another night I made Bison steaks with spaghetti squash. For the rice I started by cooking 1 cup of Organic Basmati Rice in my rice cooker. 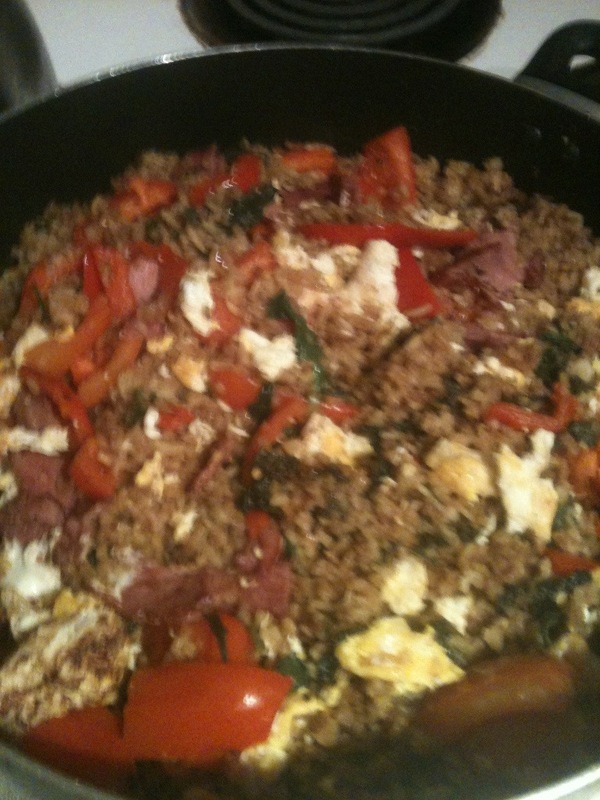 While the rice was cooking I sautéed some awesome Organic Red Peppers and Power Greens, I also scrambled some eggs and cooked some uncured turkey bacon to add. I seasoned the rice with some soy sauce, garlic powder, and tumeric. 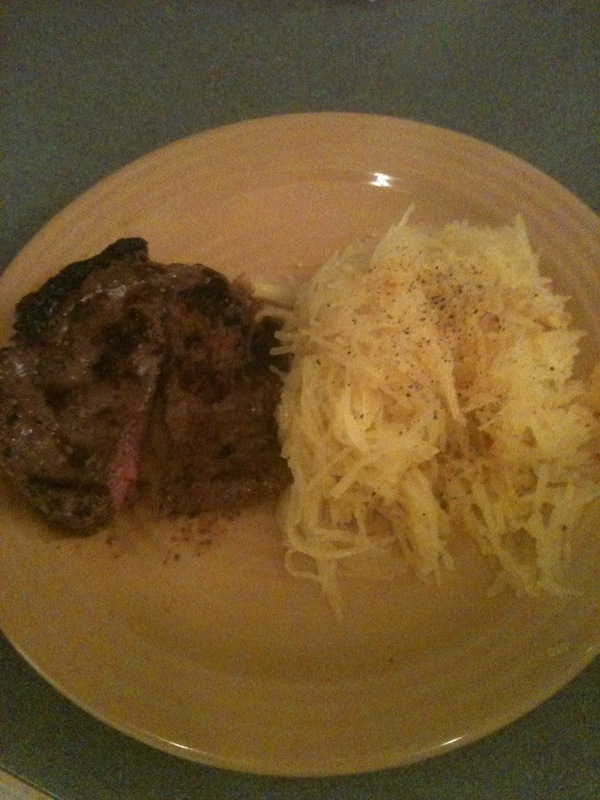 The other night I made Bison sirloin steaks with roasted spaghetti squash. I LOVE this meal! I have been making spaghetti squash a lot lately as it’s a great alternative to pasta, for “Spaghettti and meatballs”. For the squash I just cut it in half then drizzle some olive oil, salt, pepper, oregano, garlic powder, crushed red pepper and throw it in the oven for like 40 minutes at 400 degrees. When it comes out just scrape it with a fork. For the Bison steak, a grill may be ideal but, I cooked it in a pan on the stove. I used a little seasoning but it really isn’t necessary. Bison has way more protein than beef and I love the leanness. These are just some of the meals I have made lately. Eating healthy can be expensive but it’s a lot easier when you get creative and mix it up. I try to use organic produce as much as possible and stick to grass fed meats. I eat a lot of certain things like grass fed ground beef, sweet potatoes, and kale. There are other things like grass fed butter in my coffee and lots of dark chocolate. I have been trying to drink more Kombucha instead of alchohol. If any alcohol I am somewhat conscious of having red wine before beer. This is all just what has been working for me and everyone should try new things and see what works best for them. 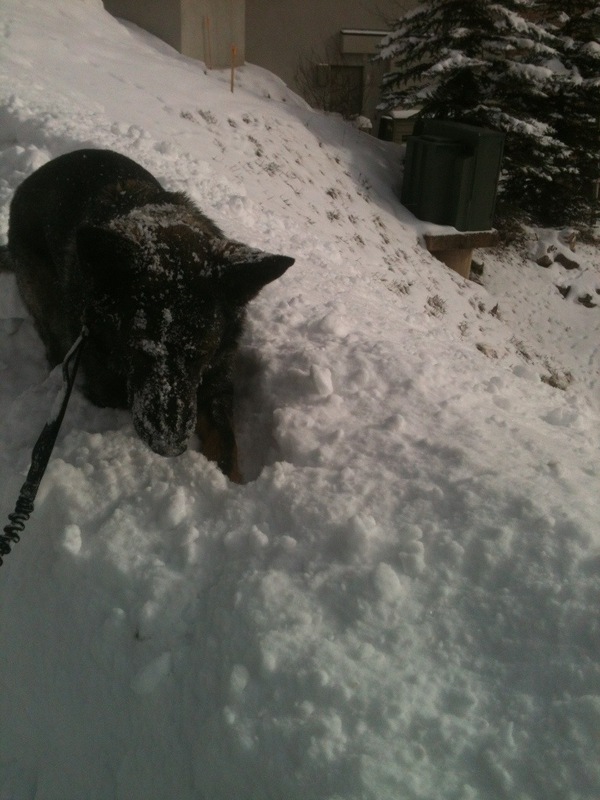 It has been DUMPING snow in Vail lately and my dog still needs to run. Not that I need my dog as an excuse to get out and run more but, it helps! 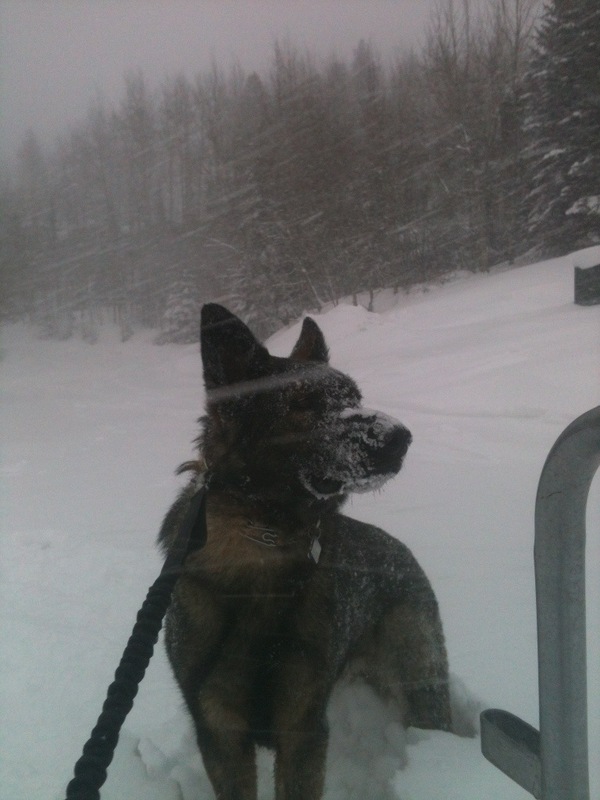 I know he loves being out in the snow and so do I. This was the first time I wore snowboard goggles while running. I thought it may be a little silly at first and that I would over heat but, they had good venting and I kept the pace down till the end. We started off about the same as our last run and just went over the pedestrian bridge to Lionshead and over the skier bridge to forest road. 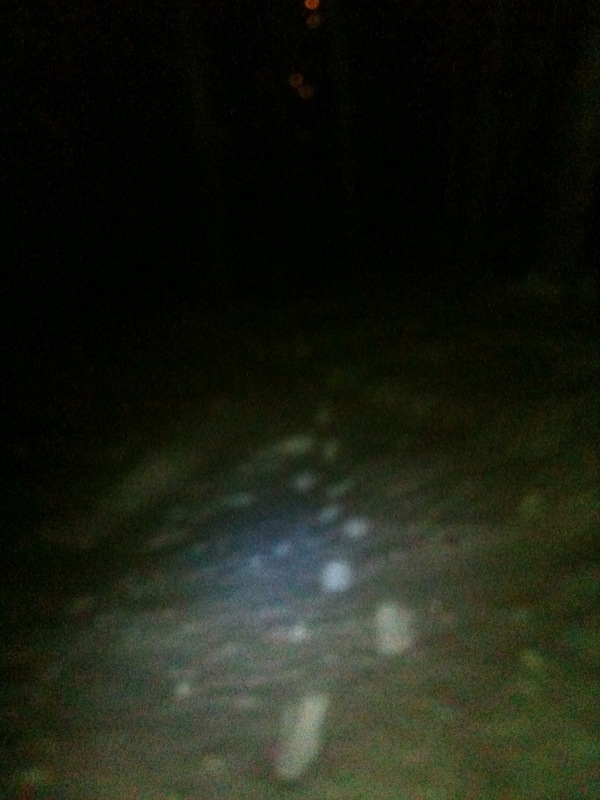 Running in the snow is kind of like running in sand where it tests your footing and works more muscles. 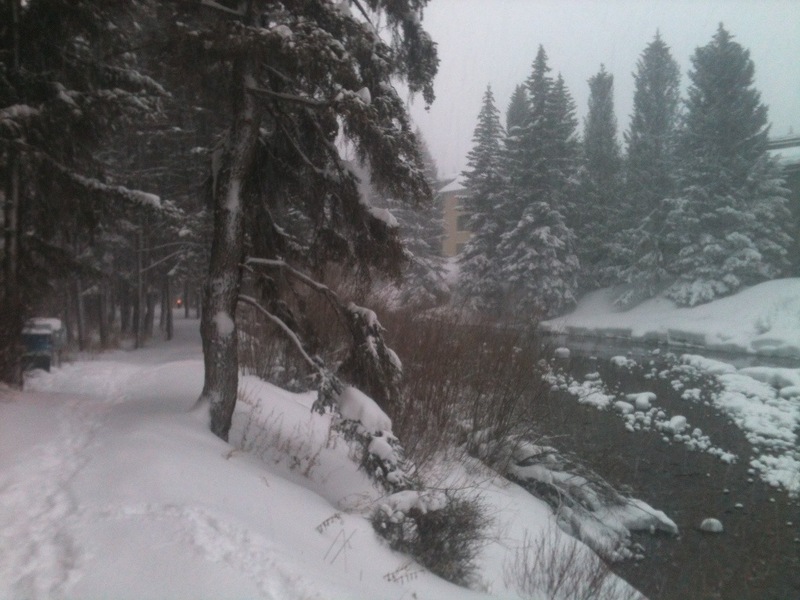 I also like running in the wind and snow for “mental toughness training”, I’ll tell myself, “I bet not too many other runners are out training in crap like this right now!” We made it over to Vail Village and wondered around the town and base area letting Rooster socialize a little. I picked up the bike path over my Golden Peak and passed the covered bridge cutting back through town and back on the bike path through Lionshead. 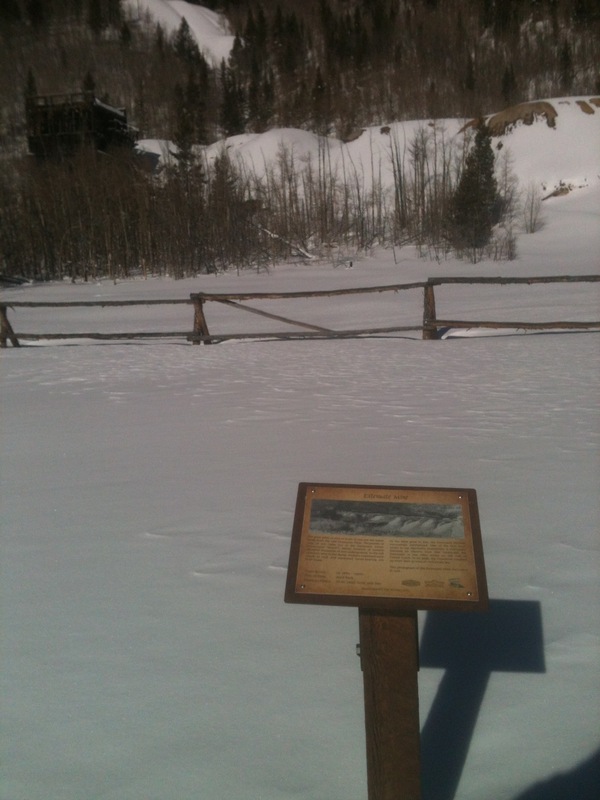 This is where I decided to make it a longer run, I was dressed appropriately and feeling good so we decided to keep going to West Vail. 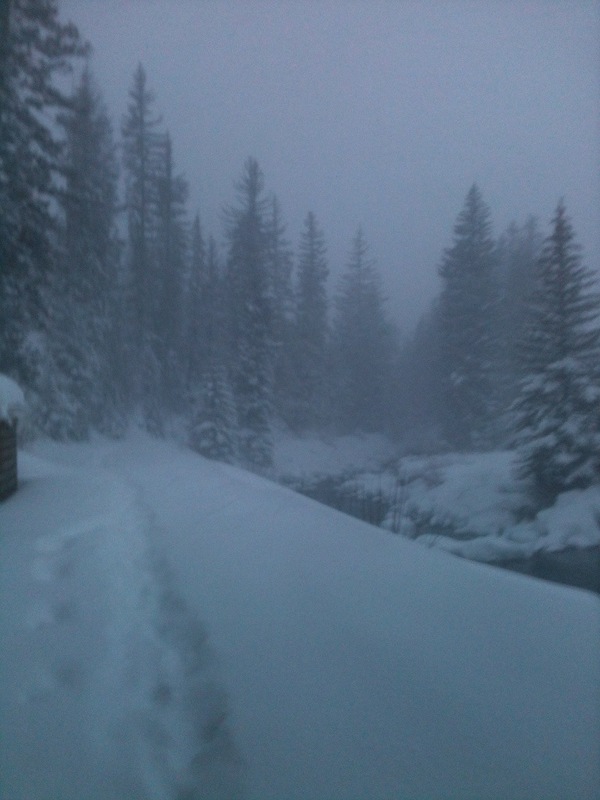 This is also where the bike path got DEEP; we were breaking knee deep powder for a while. 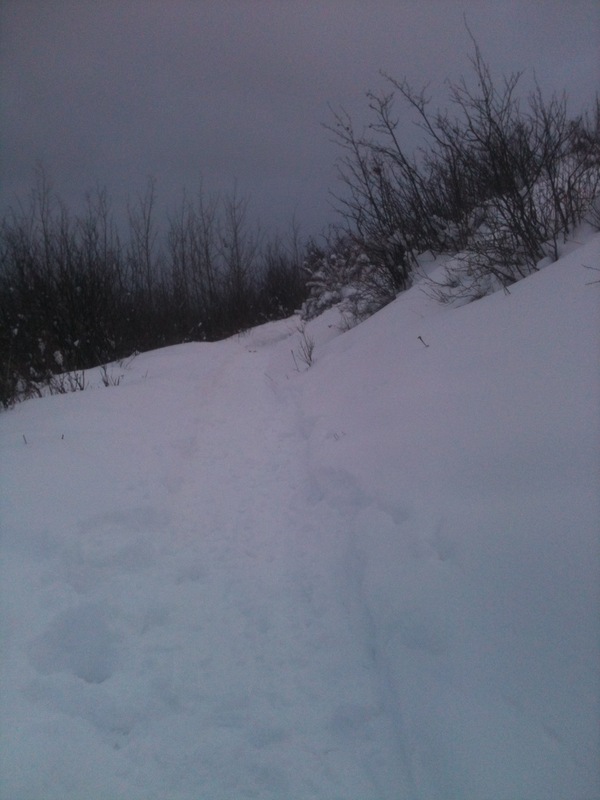 I love pushing through deep POW on a run and really feeling your core get worked. The bike path was beautiful with fresh snow all over the rocks in the river. We made it over to west Vail and through the traffic circles then took the back way home through the west Vail neighborhoods. There are a couple small hills on the roads getting back to my place, I had some good tunes going and crushed the last couple miles. 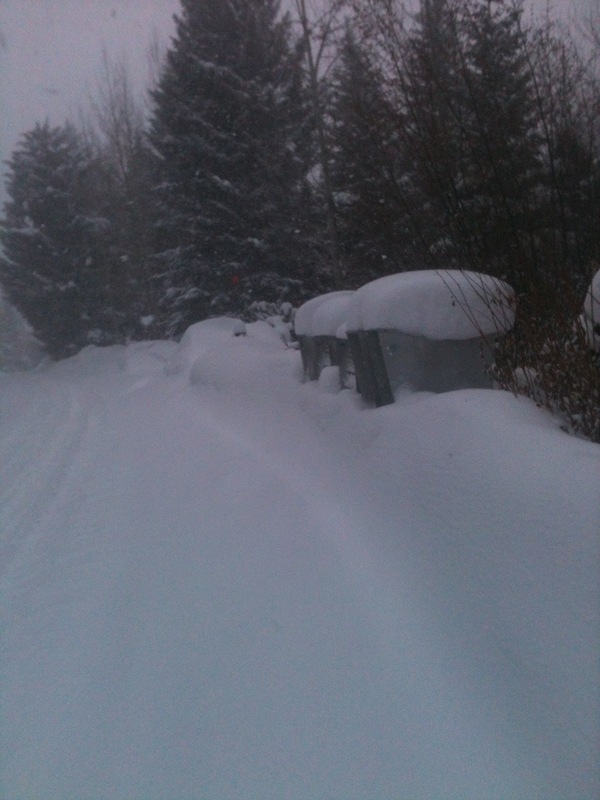 If felt amazing to get out there in a snow storm and get a good longish run in the books. I wore my Max protection DryMax socks with GTX Scarpa Spark shoes. I had Pearl Izumi Thermal running tights under Under Armor pants. I had Scott Mittens, Patagonia Soft shell jacket and Thermal. I had a Buff around my face, Anon snowboard goggles, and a Salomon fleece lined winter hat. I wore my Nathan vest and ate some of a Kate’s Energy bar. After I made a smoothie with soy protein, almond milk, spirulina, blueberries, yogurt, and kale. 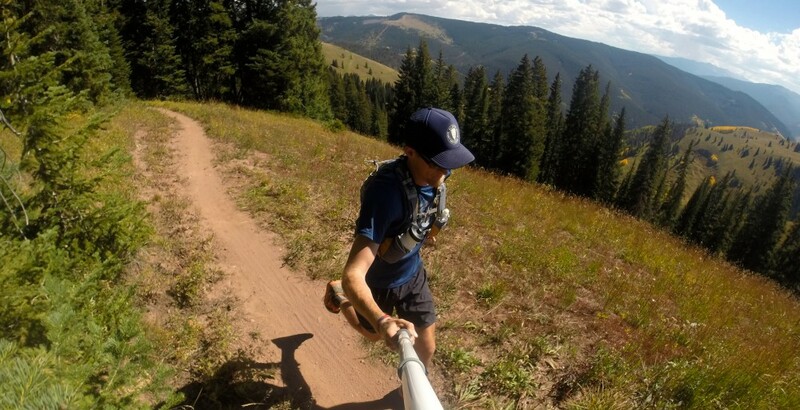 I would love to blog every run but sometimes they are not the epic adventure I hope for. Sometimes they are just peaceful meanderings around town on the bike path and roads listening to music, enjoying the scenery and picking your route as you go. This Tuesday night I got out of work around 5:30 and headed out for a run with the dog. I threw some checks from Christmas in my pack so I could deposit them in the ATM; I love running errands, literally. We ran across the pedestrian bridge and through Lionshead village, going up the ski slopes to forest road. 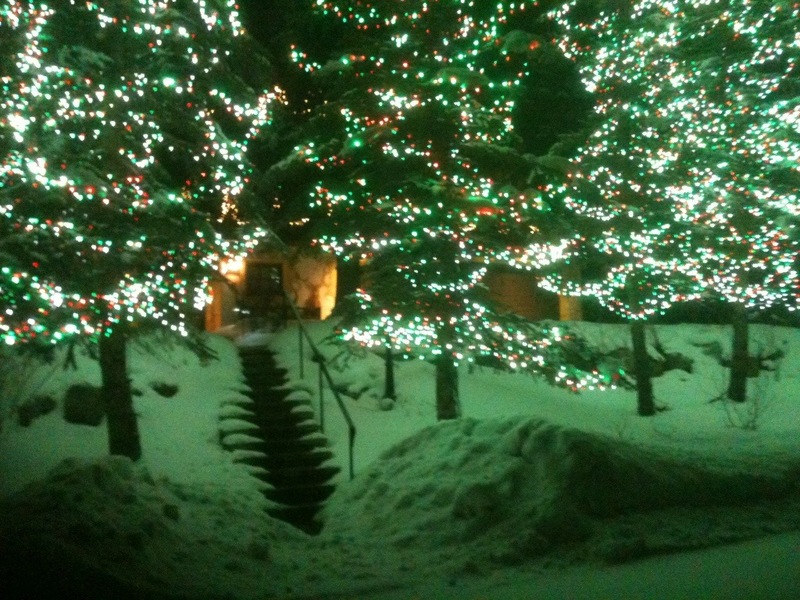 It was snowing out and dark already, Forest road was peaceful and lit up with beautiful snow-covered multimillion dollar mansions. 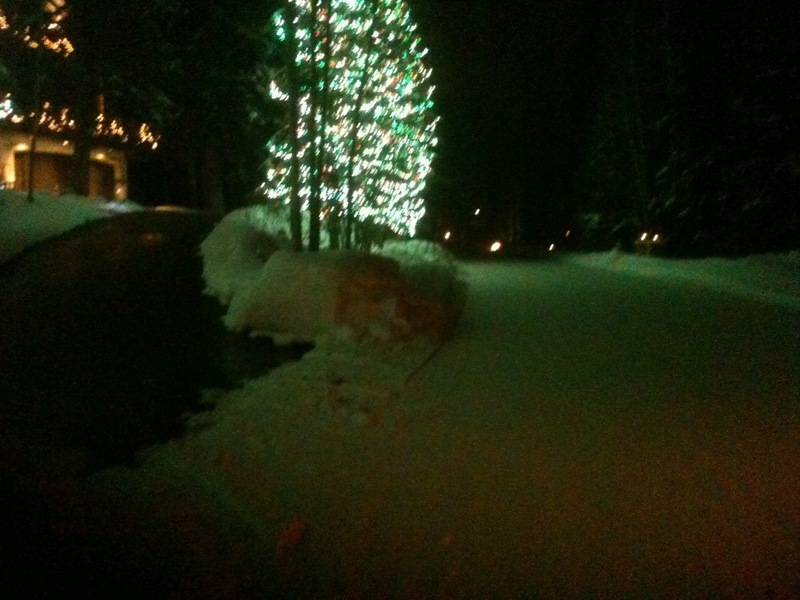 Rooster was having a blast jumping in every snowbank possible and I was finding peace in the dark snowy night. We made it over to Vail Village, hit up the ATM and turned around, deciding to take Forest road on the way back to since it was so quiet. 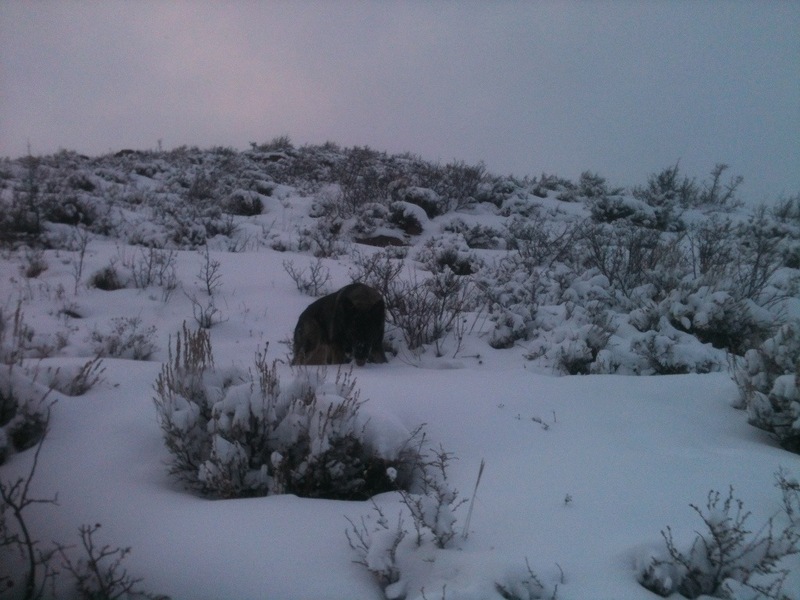 The next morning I woke up at 7AM to get Rooster out for a little run before getting out on the mountain for snowboard. At first I was just going to go around the block but turned it into a 45 minute loop because I was feeling good and wanted to stretch the legs. 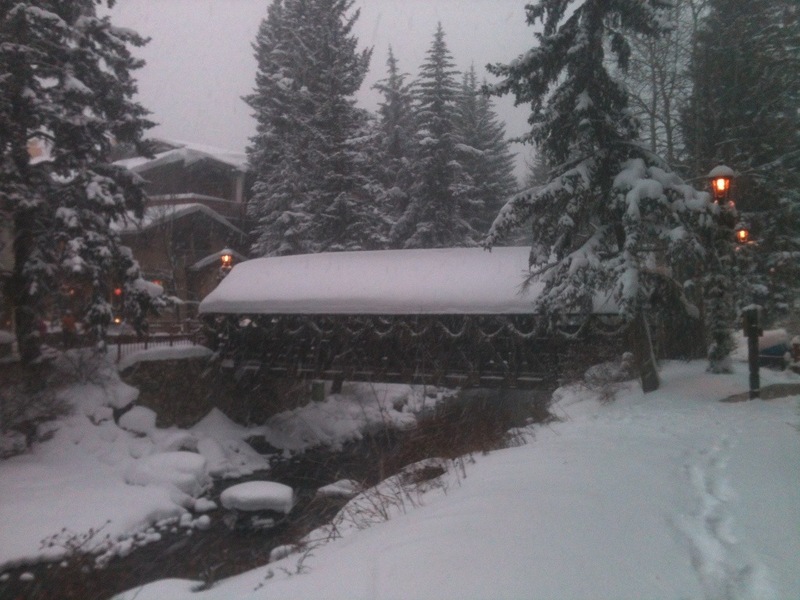 It has been snowing a ton here in Vail and even just the runs around town are beautiful. My legs feel good and I would say that I have been doing a good job getting back into that winter strength building mode. My diet seems to be better; the Paleo/perfect health diet seems to work for me. Build the fire then light the match, right? I have been snowboarding a lot of powder when I’m not running which is fun and good for my mind. I am very excited about the opportunity to be on the 2014 Vertical Runner Breckenridge Race Team and look forward to running with a great group of people. I have been working a lot during the Holidays and taking a sort of break from trail running but was able to get on the North Trail today. 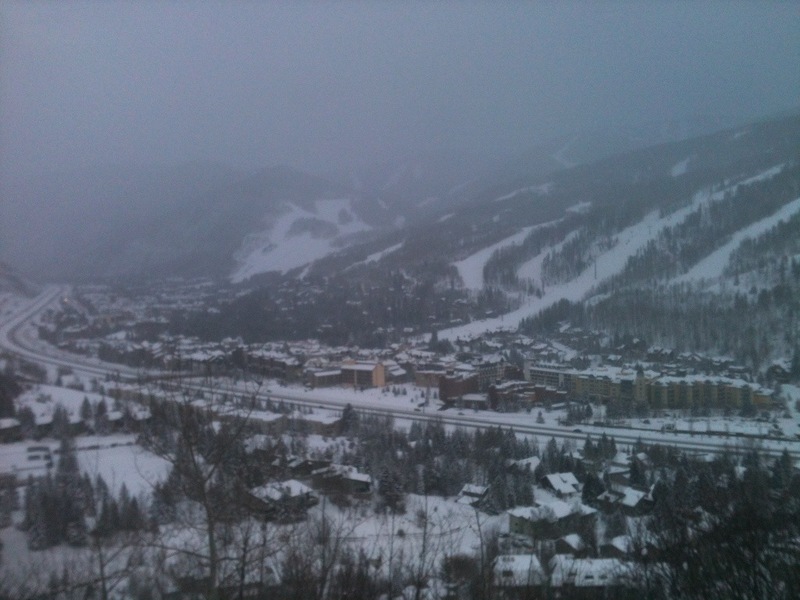 It has been dumping snow in Vail and was snowing when I got out of work. Rooster and I were both happy to get out for a run and even though the bike path has been beautiful we decided to check out some trail. I bundled up in long underwear, pants, thermals, jacket, hats and gloves, with my Scarpa spark Gore-Tex shoes. At the trail head I saw two snowshoe-ers coming down and it worked out nicely how the trail was packed down but pretty fresh on the sides. It was great to be out on the trail and we only went up a couple miles. Before the run I tried a Bison EPIC bar which tasted great and seemed to have no fueling issues. These are 100% Grass Fed Bison protein bars from a great company in Austin, TX. 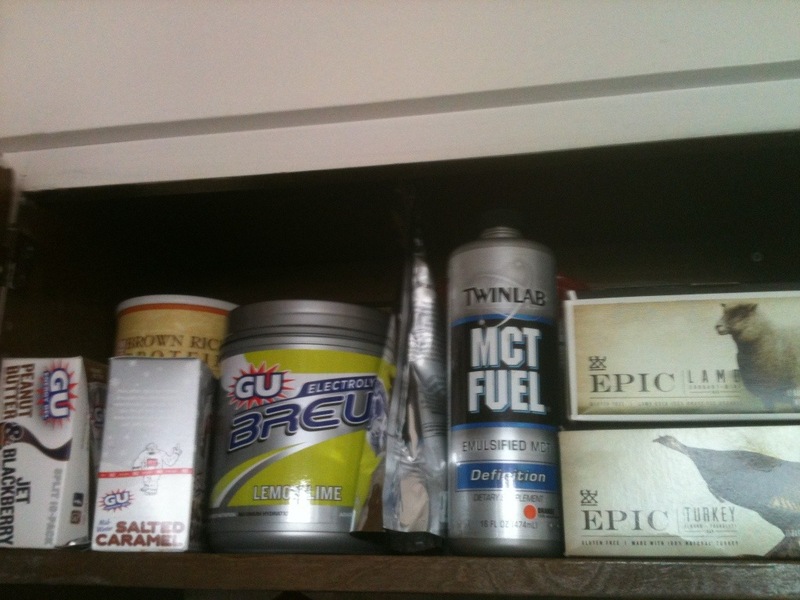 I also brought a Salted Carmel Energy GU and some Lemon Lime GU Brew which was nice to have out on the trail. I signed up for my first 50 Mile race today, The Run Rabbit Run 50 Mile Race. Signing up for a race is always motivation to get out for a run, not that I needed it. 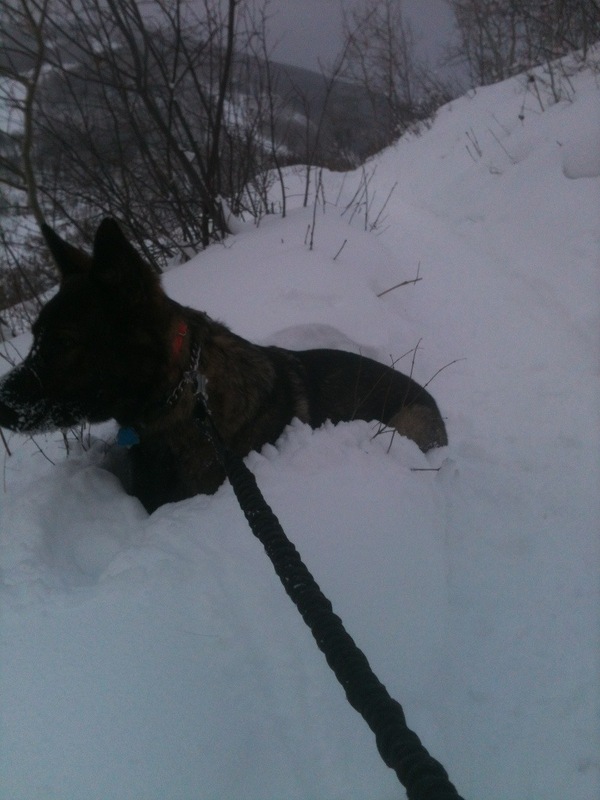 It was beautiful with all the snow and felt great to get some trail time with Rooster after a busy week. Cant wait to ramp up the training as this winter progresses and get ready for a summer full of trail running!! !